66-year-old Mdm Lau Kwai Hoi is a familiar face at Hua Mei Elder Person-centred Integrated Comprehensive Care (EPICC) centre at Tiong Bahru. Her day at the centre starts at 9:30am in the morning and ends when all the seniors head home at 3:00pm. She helps to wheel the seniors into the centre when they arrive, serve breakfast, assist in morning exercise and cognitive activities like card games and puzzles. Just before lunch, she will be up at the food serving area to help the centre staff to dice up plated servings into smaller pieces so that it is easier for the seniors to chew and swallow. After lunch, she joins the seniors for some more activities until it was time to leave the centre for home at 3pm. Kwai Hoi has been volunteering in this routine since June 2017. And there is no stopping. Kwai Hoi retired in 2016 after working 15 years as a seamstress for a school uniform supplier. “It is difficult to continue work as the inflammation on my knee was worsening and the work in the factory requires standing and walking,” she explained. Even though she plans to retire to heal, Kwai Hoi felt that she has more to give. “It was a great relief from my regular work stress after retiring. However, I also realise that I have more time on hand now, plus I am still healthy and energetic. I can give and help those in need,” she said. She found out about volunteering at the Foundation through her friend, Alice Chiam, who is another active ager working for the Foundation. “Alice and I are both in the QiGong class. Honestly, I am doubtful if Tsao Foundation would even consider my application as I had to walk using the aid of an umbrella to relieve the knee pain,” she laughed. Alice invited her to visit the Hua Mei Elder Person-centred Integrated Comprehensive Care (EPICC) Centre at Tiong Bahru to see for herself if the environment fitted her aspiration. She recalled looking around and talking to the centre staff to learn more about the centre activities and whether there was an area she can contribute. Don Tan, Head of Programme and a Senior Social Worker met her to explain the work at the centre and encouraged her to try out twice a week as a start. Today, Kwai Hoi interacts freely with the seniors around the centre and walks at ease without using her umbrella as support anymore. “She goes about her day with such zest that she is an inspiration to the seniors we serve and an invaluable resource to our care team. She requires no supervision and carries out her assigned duties like clockwork. And she is amazingly good at handicrafts, ” Don added. 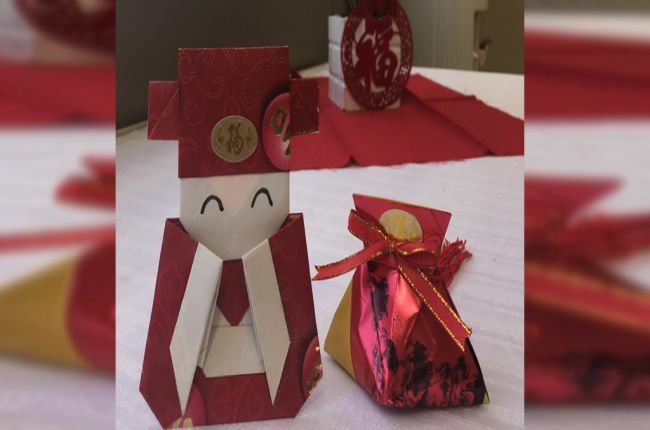 Kwai Hoi discovered an origami idea using Chinese New Year (CNY) red packets to make it into a lucky pouch. She handmade close to 150 pouches to deck the banquet tables at this year's CNY luncheon celebration for the seniors. The EPICC care team considers Kwai Hoi a close member of the team and involve her in some of the outings and as well as activities outside work. One such social activity is the weekly aqua-aerobics which Kwai Hoi picked up with Adeline Neoh, EPICC's Programme Assistant, more than a year ago. She now attends the activity weekly with Adeline at the Delta Swimming Complex. Married with two sons, Kwai Hoi has been in the tailoring business for more than 40 years, and she is just happy that she is still gainfully engaged as a valued member of the EPICC team and making a difference. “Being able to work with the seniors as a senior myself is both a privilege and a reminder to me. It is fulfilling just by seeing how the little help I give makes them happy. And when they are happy, it makes me happy,” she beamed. “At the same time, I am also constantly reminded the importance of staying active and healthy as I age. To spend my retirement playing a positive role in their life feels substantive, to say the least,” Kwai Hoi reflected.